In Tokyo, Japan, Cath Kidston is giving away a promo gift Notting Hill Rose bag and British flag pouch with the purchase of its special British issue Spring Summer 2012 magazine. This magazine cost 1,500Yen and can be found at the bookstore in Narita airport or at most major bookstores in Tokyo. Cath Kidston is an English designer, businesswoman and the founder of Cath Kidston Ltd. The company started off with a single shop in London’s Holland Park and has since expanded. Most of their stores can be found in UK or Japan, they also have stores in China, Ireland, South Korea, Taiwan and Thailand. The company sells products such as home furnishings, bags, accessories and clothing. Their products are well known for their floral patterns. This special magazine publication has the bag and pouch as a promotional gift helps to draw new customers. 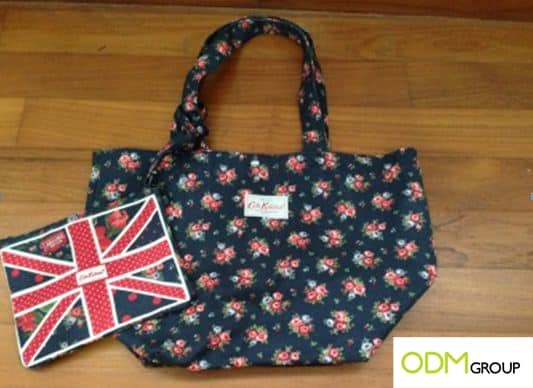 As the Cath Kidston products are generally much more expensive than the price of the magazine, giving away a sample of its good quality bags and pouches helps consumers have a taste of how good the Cath Kidston is. When they are satisfied with this promotional gift; they would want to buy other Cath Kidston products. This would help bring in new customers. Apart from bringing in new customers, having such a promotional gift would entice existing customers to purchase the magazine as it would be like purchasing Cath Kidston products at a lower price. This would help to increase sales. Having a special magazine publication allows the brand to advertise its products. Less popular products can be featured in the magazine, drawing the attention of the reader to purchase them. Also, new products that require advertising can be promoted in the magazine. Having such a publication is a cheaper way of advertising as customers seem to be purchasing the advertisements.